Most people going to their first university lecture worked hard to get there - but few have a journey like Malala Yousafzai. Today the world famous education campaigner tweeted a picture from her first class at Oxford University - five years after she was shot in the head by militants in Pakistan. The 20-year-old Nobel Peace Prize winner accepted a university place in August at Lady Margaret Hall college to study philosophy, politics and economics. "Five years ago, I was shot in an attempt to stop me from speaking out for girls' education. Today, I attend my first lectures at Oxford," Malala wrote today on Twitter, which she joined in July after finishing school. "All the best. You are such a wonderful inspiration to every girl," wrote one Twitter user. Another tweeted: "Congratulations Malala. You stand as a beacon of hope to women and all of us in this world. Enjoy university!". 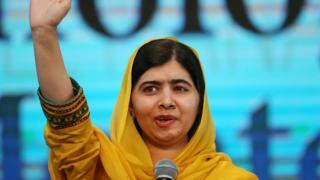 After recovering from her near-fatal injuries, Malala and her family relocated to Birmingham, UK. She became an internationally known symbol and advocate for the fight to improve girls' literacy around the world, and in 2017 was made the youngest ever UN Messenger of Peace.